So it’s official now. The Republic of South Sudan is a country. In case you’re curious what you have to do to become a country, here’s a brief list. The list fails to mention the need for a country code. In fact, I would put a country code right up there with international recognition. And, as Paul Sawers at Next Web wisely noted, South Sudan is facing a country code dilemma. As illustrated above (based on my ccTLD map), South Sudan has applied for the .SS country code. Needless to say, this is a rather loaded acronym, and many feel that it won’t be approved. But there aren’t many alternatives. Sudan already has .SD. The .su (Soviet Union) domain could be redelegated except for the fact that there are people still using that domain for legacy sites. So I would imagine the .SU route could be a bit challenging, though it appears to be the best linguistic fit. 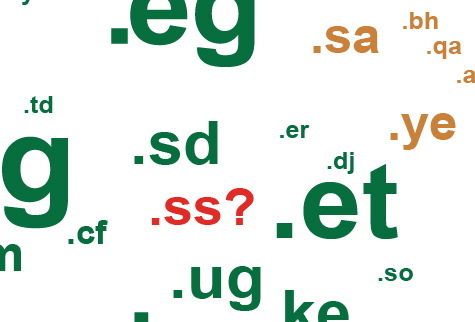 What other domains are available that begin with the letter S? I found SF, SP, SQ, SX, and SW.
That’s the tough part about being a brand new country — you’re last in line for the country codes. Now, South Sudan could get a little crazy and apply for .AA or .YY, which are also available. Though I can’t imagine they would get approval. In an alternate universe, if acronyms like “DE” or “FR” had made Africans uneasy, would Europeans have been willing to give up their TLDs? It’s unfortunate that South Sudan should possibly be refused the logical name of its choice because it makes some foreigners uneasy. Could it be that we need to go for 3 digit country codes? Even there though South Sudan has a bit of an issue there with SOS. As the CNN article you link to confirms, ‘South Sudan’ may turn out to only be a temporary name anyway. AZ, NR, NI and KR are all taken already, but they could certainly have JU or even AN, once the Netherlands Antilles splits into three. Re-usage of ISO country codes has taken place in the past (CS first for Czechoslovakia, later for Serbia and Montenegro), but will not in the future (cf. http://www.w3.org/International/articles/language-tags/#bytheway). Re-usage of country TLDs is probably not a good idea either. SS should be approved too if SD was: they were similar bad, and are both as loaded for people who experienced them. According to http://earth-info.nga.mil/gns/html/whatsnew.html, the official new FIPS code for South Sudan is “OD”. But people are much more likely to understand and remember “ss” for the TLD. Personally, I don’t think the Nazi associations of .ss are that strong — SS stands for so many things. Maybe it depends on your age. Lars — thanks for the update on “OD.” This will be interesting to watch develop.